The week leading into my very first race of the year was busy and didn’t leave me with much time to actually think about my coming race. Between work, workouts, running to appointments for my knee pain, packing and traveling, my mind was on overdrive and I was maximizing every free minute, even more so than usual. My flight to Orlando on Wednesday night was delayed almost two hours so I didn’t land in Florida until shortly after 1am. Stopwatch Greg was waiting patiently to drive me back to our rented condo just south of Clermont. Greg had arrived mid day Tuesday and was all settled into our lovely two bedroom, two bath condo (surprisingly one of the most affordable places to stay) by the time I arrived. My head hit the pillow around 2:30 am but I struggled to fall asleep. Thursday I worked a full day but took a break for a hot run with some intervals (and snakes!) over lunch. In the evening Greg and I ventured out to a local pool only to find it was closed. After a few loops around Orlando we finally landed at the YMCA Aquatic Center. The pool was filled with people, a water polo game was going on with parents filling the stands, swim practice, synchronized swimming practice, water polo practice, diving practice, swim lessons and intermixed there were some random open swim lanes. I was able to get in a quick 2.5K and called it a night (I only got hit in the head by one water polo ball going out of bounds). Leaving the pool I noticed the record board filled with the names of past and more current Olympians; apparently this is quite the famous pool. I later found out they host the Junior National Championships every year and now that record board makes sense. Friday Greg and I headed out to the race site at Lake Louisa state park in the morning. I was able to ride a couple loops of the course and swim the in the lake. I have never swum in a more foreboding looking lake in my life. The water looked somewhat copper colored washing onto shore but swimming in it, your hand just an inch beneath the surface was blood red and after that thick black darkness. The water was rough, there were white caps and honestly it was rougher than any ocean swimming I’ve done (the conditions didn’t change for the race). The temperature was in the mid-sixties so it felt great for a wetsuit swim. After my swim we headed back to the condo for a much needed nap. Patrick arrived that afternoon so he was able to join me for the pre-race meeting that evening. At the meeting they reviewed some general rules and course information, most notably there was a major change to the swim. The swim course would now include a beach start, mostly out and back swim with about 100 meters of swimming parallel to shore, which meant 300 meters of swimming into the tides. After the meeting we headed to my favorite restaurant, Sweet Tomatoes, where they have a huge all you can eat salad bar, which is my typical pre-race meal. After filling up on goodness we headed back to the condo where I reviewed my race day lists, put the final touches on gear and got to bed. Race morning was fairly low-key, my race start time was 10am so I didn’t have to wake up until 6:30 which was a nice change from the norm. I ate breakfast, packed up snacks, coffee, gear and headed to the park to get in line for our designated entrance time (other races were going on so you couldn’t come and go as you please). After parking the car, I got my bike, uniform and gear checked quickly by the officials. Shortly after that I setup in transition and there were less than thirty minutes till race time. Lining up for intros and the race start. Down at the beach I was excited to finally be wearing and racing in my new BlueSeventy TX3000. It was windy again and cold by the water so I slid into my Helix to stay warm. 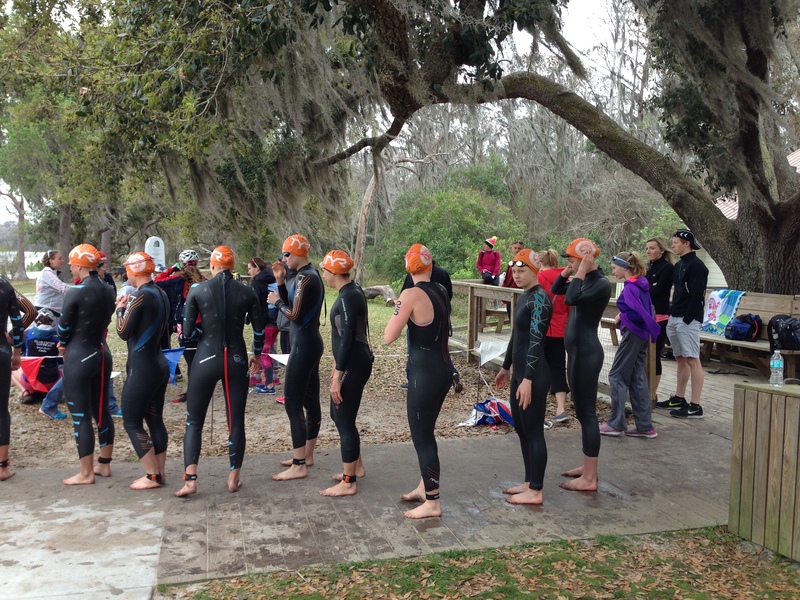 I did a brief warmup swim before we had to line up for introductions and the start of the race. My race number was 22 of 26 (race numbers are assigned in order based on ITU points the athlete has, since I have none I was towards the bottom). This is also the order for picking your starting spot on the beach, so I got one of the last spots and wasn’t near the other top swimmers. The gun went off and we were all rushing at what seemed like the same two feet of open water. I tried not to completely go over anyone but there were definitely bodies beneath me at times. I pulled my way around a few people reaching for whatever open water I could find all while trying not to inhale what seemed like tidal waves trying to take me under. After getting some space I could already see the leaders were about 10 yards ahead. I set my sights on the first buoy to make sure to swim the shortest distance. Once around the buoy I thought it would be easier swimming parallel to the waves but it wasn’t. I kept the leaders in sight and planned to make a move to catch them swimming into shore with the current. When I got to the buoy I went to make a hard left back to shore but oddly only one swimmer was in front of me and she was stopped as well, I looked right and three of the leaders had kept swimming past the buoy. After observing for too long I realized this was an opportunity to make up the lost distance from the start. I put my head down to hammer to shore but I found myself holding back a bit, really I was caught watching the race when I should have been racing. We all converged a hundred meters from shore and I was out 2 seconds behind the leader. At least two people passed me sprinting to T1, I let myself catch my breath a little too much. In T1 my wetsuit came off fairly easily, I threw it into my box and then went for my helmet, it took me a few tries for my helmet to finally snap. I passed one person heading out to the mount line. I did my flying mount for the first time, it was much faster than my usual mount where I literally stop completely to mount (I learned this mount on Friday with Patrick and I only fell over twice practicing :-)). That said, I misplaced my feet and my shoes went spinning while I tried to readjust; I lost some precious time there but once I got set I went sprinting out onto the course to find the nearest bodies. There were two girls ahead that I worked to catch a few kilometers in. Once with the group I finally got my feet into my shoes and strapped in working to catch the next two girls ahead. Sarah Haskins was much further ahead off the front by herself as she had nailed her T1, no surprise there! Finally we were a pack of seven and it was a bit disorganized. The girls were riding single file so I tried to get a second line going to start a rotation only to be accused of sucking wheels the whole time and not taking a pull (I spent a lot of time at the front after that comment). If I wasn’t towards the front on the 180’s or through transition I got yo-yo-ed off the back pretty badly and had to work hard to catch up. Luckily I lead through transition twice and through many of the 180’s. A few times some girls tried to make a break, I went with them every time but once I rotated to take the lead I found they really weren’t that motivated to make a break. I got yelled at a few different times during the race and I let it get in my head too much, by the end of the fourth lap I hung back just waiting to get off the bike. Coming into T2 I apparently forgot how to dismount so I stopped completely, straddled my bike, threw my leg over and finally ran to my spot. Surprisingly I got my shoes on quicker than ever and was off running. My run felt solid from the start. The sun was now out, it was hot and there was no shade but I actually didn’t mind. The girl right in front of me was huffing and puffing really hard, like the wheezed breathing I experience when I need my inhaler, I felt empathetic as I passed her. I settled into my pace and cruised along. The course was two loops, out and back, so you could see where your competition was at three times along the course. Heading back out for loop two there were a couple girls gaining on me but I held steady. As I approached the finish, crowds were cheering so I was motivated to pick up the pace a bit and book it into the finish line. I actually think the run was the most enjoyable part of the race, I must be ill.
After finishing I met Patrick and my Dad and all I said is let’s get out of here. I felt defeated and embarrassed by my work on the bike and wanted to hide away like a dog with its tail between its legs. We stuck around for a little bit and I chatted with a few acquaintances but we didn’t hang around long. I needed to decompress and most importantly, eat a decent meal. I’m sure you can tell from my report that I was pretty down about my race but now that the dust has settled I’m able to put some perspective on the day. For starters I need to remember this was my very first professional race and only my second draft legal race. Most of the girls on the start line have been focusing on draft legal racing, they train for this style of racing whereas I mostly ride the trainer and I rode a borrowed a road bike (thanks Gear West!) that I was fit on a week before leaving. With that in mind it wasn’t as bad as it seemed, people are in the moment and there will always be yelling, I need to keep a clear head and stay in the race. On the swim I need to tap into my old water polo self and be aggressive on the start, no Minnesota nice finding space, I need to claim space for myself. I also need to keep my head down and do what I do best, swim! I can’t get caught watching the race in the water, if someone makes the wrong turn I need to keep swimming full throttle forward. Finally on the run I can’t just sit back and be comfortable, I need to race and push myself a little further into the pain zone. Going into this race I didn’t have a lot of time to think about race plan or strategy but now that I know what I’m up against I hopefully will plan better for Saturday’s race in Sarasota. Check out Saturday’s preview. Check out the results. This was so awesome to read! I’ve raced “with” you a few times and it’s interesting reading about your transition to pro and your experiences with the draft-legal scene. The real-life frustrations are great to share, learn from, and make for entertaining stories later on. Thanks for sharing them! Thanks for the comment Jayme! I’m sure I’ll see you out at some races in the future, keep up the good work!